What is the best Sony 4K TV for gaming? And should you buy OLED or Triluminos? Spider-Man is in town, everyone loves him, but what’s the best TV set to showcase the web-slinging superhero? 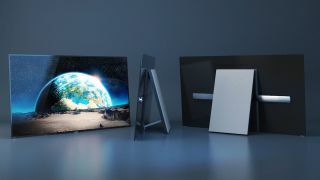 You'd assume it would be smart to partner PS4 games with a Sony TV, given that the Japanese giant offers both high-end OLEDs as well as premium LEDs featuring Sony’s very own Triluminos panel technology. But do gaming studios work hand in hand with engineering teams at Sony’s TV branch? Not as much as you would think. The moment I hook up my Samsung QLED on a PS4, it automatically switches to game mode and changes PS4 Pro settings to 4K HDR... but I have to do it manually on Sony sets. Not a great start. What I love about Sony TVs, though, are two things: first is Acoustic Surface audio technology used by the brand new A8F OLED, that lets your whole panel vibrate to generate very clear sophisticated audio with deep bass that moves with the picture. Second is strong black levels, due to Full-Array-Local-Dimming. These are the features that really make Sony TVs special. But are they good enough to merit places on our best gaming TV guide? Or our list of the best 4K TVs for gaming? Let's see what they offer. Sound can be a powerful creative tool. Imagine a scene where the arrival of a car is a dramatic moment because the next 30 seconds will fundamentally change the story. Acoustic Surface technology uses two actuators that put the whole panel into a slight vibration. The sound dynamically vibrates from the screen: you can clearly hear that the car is coming slowly from the left, entering the gateway to a huge mansion in Mafia 3, one of our test games. By leveraging the whole size of the panel, Sony also creates an intense bass. Most TV sets only offer a fairly flat sound, but here the subwoofer is built into the body of the TV. Unfortunately, this feature is only available for Sonys most premium OLED sets - the A1 and AF8, so you have to pay the big bucks. It does mean saving on gaming sound systems, though. Pros: Sony's Triluminos panels are based on LEDs that leverage fluorescent nanoparticles, which glow with a blue light. That actually makes a huge difference because traditional LED sets use white light, while the blue one allows Sony to show a more diverse color scheme, temperature and depth. It’s a technology comparable to Samsung's Quantum-Dot. One area I noticed was during a scene in Uncharted 4 where Elena's lipstick is very shiny, and the tone has a certain blush to it. It can also make Spidey's Avengers-Suit really pop. Not as much as QLED, though, due to a peak brightness of 1000 nits in comparison to Samsung's 2000 nits. And the black levels go almost as deep as OLED without the risk of burn-in, which is quite a plus. Sony has also invented a smart way to deliver HDR optimization for non-HDR content. Basically, each and every object that is supposed to be rendered in 4K HDR, goes into an internal database where the system figures out the perfect color depth and shadows. Fur on animals, for example, is tough to remaster in HDR, but the database has the perfect picture-settings for it. Meanwhile, other objects are treated to different settings, which attempt to recreate HDR in different ways. It's very clever. Cons: While Sony has great color reproduction, processing and inputs are slow. Changing menus happen with a snap of a finger on Samsung's QLED sets, but they take a couple seconds on Sony's. If you just want to game, all fine. If you watch a lot of TV, beware of this fact because changing TV programs takes time. Sony also seems to struggle with the viewing angle - even top-tier sets like the 2018 X900F require you to sit in the center for a perfect viewing experience, otherwise colors fade out. Sony TVs offer both HDR 10 and Dolby Vision, but what’s the difference? Dolby, as a company, has set the gold standard for surround sound as well as 3D audio, thanks to Atmos. Now they're trying to do the same on the picture side. And, yes, Dolby Vision is technically superior to HDR 10: HDR 10 allows for 10 bit and peaks at 1.07 billion colors. While Dolby Vision uses 12 bit and peaks at 68.7 billion colors. On paper, this means much smoother gradations between colors but, quite frankly, you have to watch a scene frame-by-frame to actually notice a difference. There are a couple of other superior features, like better tone mapping, but for now HDR 10 is the winner. While there is some DV content available on Netflix and Amazon Prime, the game industry uses HDR10 as a standard for Xbox One X and PS4 Pro. This might change with the PS5, if it offers 8K upscaling. At CES we saw an 8K demo of Gran Turismo Sport on a brand new Sony OLED peaking at 10,000 nits which is five times the brightness of the brightest TV on the market right now. Only Dolby Vision can leverage such intense brightness levels. What a beauty: super thin bezels, elegant black stand, minimalist design at its best. But Sony, please change your bulky remote - it looks like Grandma's from the '70s. This is a £3000/$3,500 set so the whole experience has to be luxurious, and a delight to use. But all is forgiven when the A8F shows its sound muscles: Acoustic Surface technology is epic with surprisingly deep bass. When you put your ear on the panel, it actually vibrates and creates sound you'd only be able to replicate with a Dolby Atmos system that can adds a cool $1K to your credit card bill. I also love the super deep blacks, because Sony uses OLED panels from LG. The processing is their own, though, and it is notable how good Sonys X1 Extreme is in upgrading non-HDR content to an almost 'created with HDR' experience. It's a real boon, as gaming has only been creating HDR content for three years, so you can enjoy older games with more visual fidelity thanks to this set. Impressive contrast ratio, good black uniformity, strong local dimming and a tremendous HDR experience are on the pro front. However Sony hasn’t done a perfect job with it’s 2018 models: the viewing angle is quite poor, and colors fade out heavily when you don’t play directly in front of it. In general, this is a great set for gamers, given the excellent pixel response times. While the 8F (as an OLED) has almost 38 ms response times, which is a bit too slow for Rocket League, FIFA or Call of Duty: Black Ops 4, the X900F is faster with 24 ms at 4K/60Hz. Sony has made a couple of very weird decisions about this TV, though: only 2 HDMI ports use the full HDMI 2.0 bandwidth and that’s not enough - most TV sets have 4 ports minimum. And while the sound gets pretty loud, it lacks clarity and depth. With Sony, you get a lot of bang for your buck across its whole range. The X930E packs a direct LED backlight system, which means there is a grid of backlights behind the screen, and it features full-array local dimming. It actually uses a near identical panel to the X900F from 2018, but the processing is 40 percent faster on the newer models which is only really a concern for sports games like FIFA and Pro Evolution Soccer or fast-paced scenes with a lot of particle effects like smoke and explosions. So you get a great screen for a lot less with the X900E. What’s actually surprising and certainly something to bear in mind: Sony's 2017 TVs have a much better looking finish and used more premium materials like a brushed aluminum metal stand. So while the 2018 models have better processing, the 2017 ones actually look more luxurious in the living room, and their panels are just as great. Should you buy a Sony OLED or Triluminos LED in 2019? Yes and no. While the Sony A8F OLED is definitely the best Sony TV for movie enthusiasts, because of it’s supreme processing, super deep black levels, excellent color reproduction and motion clarity, there are a couple problems for gamers. Unfortunately, Sony's OLED panels have an input lag of over 30ms in 4K@60 Hz and even 48ms in 1080p (which technically doesn’t make sense), and while it may get patched, it is a problem if you want to play Nintendo Switch or any other 1080p console on your A8F. What about the X900F? It features full-array local dimming that’s great for stable brightness and black levels, and the panel is also seriously fast - so, yes I'd heartily recommend this model AND the X930E. Just a pity that Sony still hasn’t dealt with its slow interface and has some minor problems with its top of the range sets.